Don talks with Dr. Mark Hanks from Kindred Spirits Veterinary Clinic about Dr. Hank’s recent experience dealing with a serious health crisis with his dog Pierre. 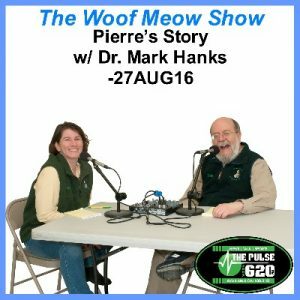 This was the first time that Mark had not treated one of his own pets in many years, and he describes how the experience has changed him and his approach to veterinary medicine. Kate and Don discuss the growing problem of pet obesity in the United States with Dr. Chris Barry from Kindred Spirits Veterinary Clinic. 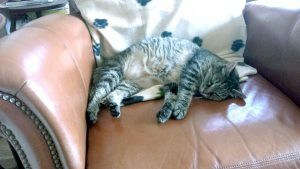 We discuss why obesity is such a serious problem for our pets, and what we can do to manage their weight so that they live longer and healthier lives. 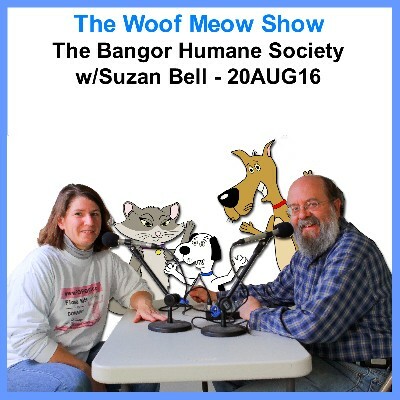 Kate and Don talk with Executive Director Suzan Bell from the Bangor Humane Society. We discuss the history of the organization, how they are funded, the amazing pets they care for and rehome, and their upcoming event and fundraiser, Paws on Parade. 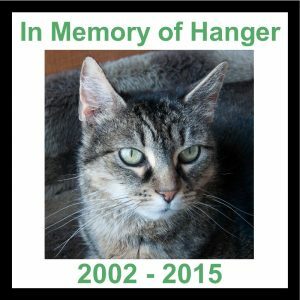 Tune in and learn more about this amazing organization that helps thousands of pets throughout northern and eastern Maine. First broadcast on 16JUL16, Don and Kate talk with Dr. Mike McCaw from the Veazie Veterinary Clinic about respiratory disease in cats; one of the top two health issues for our feline friends. We start our discussion with upper respiratory infections; symptoms, risk factors, potential causes, diagnosis, treatment, and prevention. 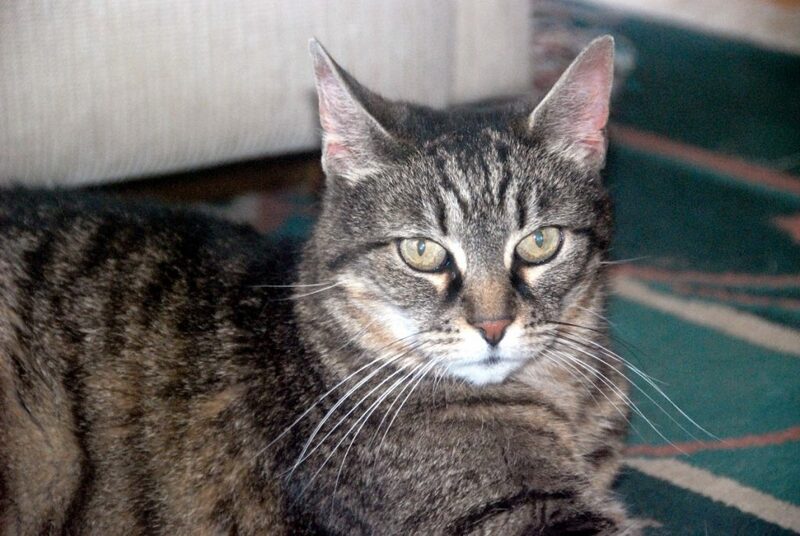 Then we move on to asthma in cats and finally the detriment of second-hand smoke to our cat’s health. 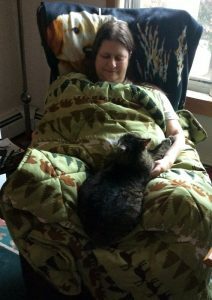 On Saturday, June 4th, deputies from the Penobscot County Sheriff’s Office responded to the report of a dog attack at a home in Corinna, ME. A seven-year-old boy died as a result of the attack. As of a Certified Dog Behavior Consultant, the media often contacts me to comment on incidents where a serious dog bite occurs, and this one was no different. The following week I was interviewed on two radio stations and by reporters from the three major TV networks in Maine. Typical questions in this type of interview are; why do dogs bite or kill, is it because of the dogs breed, and how could this have been prevented? Unfortunately, because of the way the news works, I felt my comments were far too brief for a topic of this complexity. Without adequate information, I do not see the dog bite situation changing, so I arranged to interview a national expert on dog bites on The Woof Meow Show and to also to discuss this issue here in a series of articles. How “serious” of a problem are dog bite fatalities? Janis Bradley is a professional dog trainer, author and the Director of Communications & Publications for the National Canine Research Council. Her first book, Dogs Bite, But Balloons and Slippers are More Dangerous was written as a result of an especially horrific dog attack and fatality that occurred in San Francisco in 2001. At the time, Bradley was working at the San Francisco ASPCA, teaching professional dog trainers and working with what would be considered ‘high-risk” dogs, yet she nor none of her colleagues had experienced a serious dog bite. Yet, both the local and the national media were giving extensive airtime to this incident using phrases like “dog bite epidemic.” As a result, Bradley started researching the academic literature on dog bites because she wanted to understand the seriousness of this issue. What she learned was that there was not much reliable research on dog bites. Thankfully, due to Bradley’s efforts, we have a better understanding of dog bites and fatalities today. You are1000 times more likely to be killed in a car accident or an accidental fall. You are 500 times more likely to be murdered by another human. You are 1.5 times more likely to be killed by a lightning strike. The Center for Disease Control has stopped tracking dog bite related fatalities because they are so rare and cannot make any useful conclusions from the data. 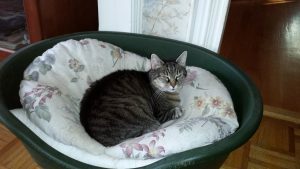 While death by a dog bite is tragic, such deaths are exceeding rare, and it is their rareness and often the horrific nature of the incident that attract a disproportionate amount of media attention. Add to that the response by people on social media, and it is understandable how misinformation is created and circulates. I want to thank the Penobscot County Sheriff’s office for their responsible release of information for this particular incident. Next month I will address non-fatal dog bites and what we think we know and what we really know. Last month I started a series on Dog Bite Fatalities and Dog Bites due to the death of a seven-year-old boy on Saturday, June 4th. My July column dealt specifically with fatalities from dog bites and the fact that while they are tragic, they are also quite rare. You are 1000 times more likely to be killed in a car accident or an accidental fall than to die as the result of a dog bite. There are some common factors in dog bite fatalities. A study published in The Journal of the American Veterinary Medical Association (JAVMA) in December of 2013 identified several controllable factors that played a part in dog bite fatalities. Four or more of these factors were present in at least 80.5% of the dog bite fatalities examined. No able-bodied person was present to intervene to attempt to stop the attack. In 87.1% of the cases reviewed, it is quite possible that an attack could have been prevented or interrupted if another person were present. This is why all interactions between a child and a dog should ALWAYS be closely monitored and supervised by a responsible adult. The same applies to an adult who may not have the physical or mental capacity to interact with the dog. The victim had no relationship with the dog. In 85.2% of the incidents, the victim did not have an established relationship with the dog for at least ninety days. 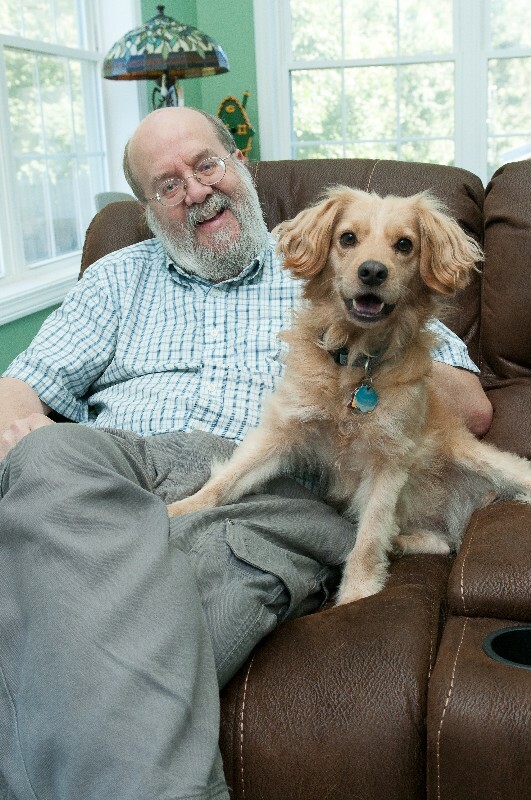 They were not necessarily a total stranger, but they were not part of the immediate household or one who interacted in a positive manner with the dog on a regular basis. The dog had not been spayed or neutered in 84.4% of the incidents. The decision to spay or neuter a dog has many variables, and it is not as clear cut as it was a few years ago. 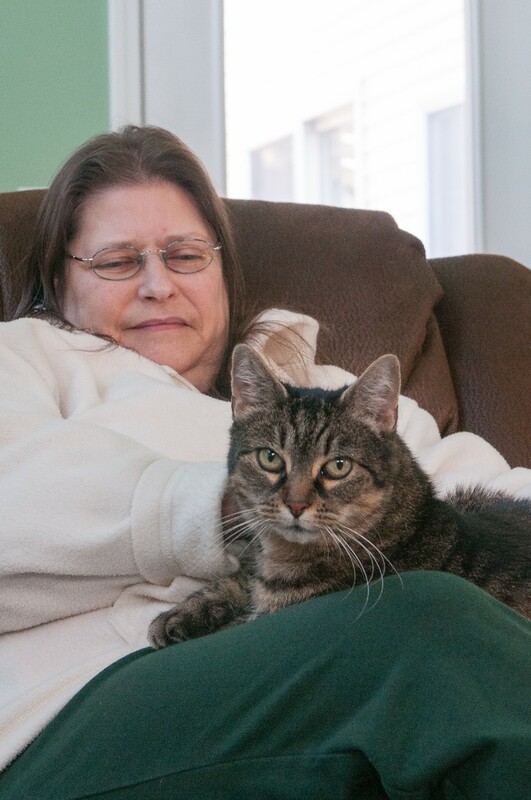 In some cases, people delay a spay/neuter due to medical reasons or the cost. However, the benefits of spaying and neutering from an animal welfare and a behavioral perspective are also well established. An individual who does not choose to spay/neuter should consider that their decision may increase their dog’s probability of biting. The victim was physically unable to manage their interaction with the dog or defend themselves due to their age or physical condition (77.4%). – For purposes of the study, “Victims were deemed unable to interact appropriately with the dog if they were < 5 years of age or they had limited mental or physical capacity that increased their vulnerability (e.g., dementia, alcohol intoxication, impairment from drugs, or uncontrolled seizure disorders). As noted above, dogs must be supervised when they are left around those who may not be able to control the dog. The dog was not a family pet, but lived on the property, often kept outside and often kept in isolation from people, resulting in little or no regular opportunities for positive interactions with people (76.2%). It does not surprise me that dogs that are considered to be part of the family, and thus have a closer bond with people are less likely to bite as opposed to a dog that is mostly consigned to an outdoor kennel or being tied-out on a rope or chain. The study described the latter as “residential dogs.” Those that keep a residential dog as opposed to a family dog, should make sure that said the residential dog is contained to limit any possibility of interactions that could result in a bite. 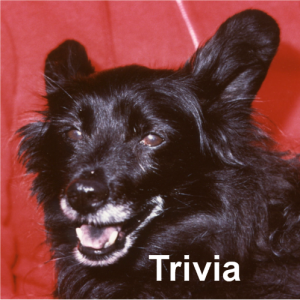 There was a documented history of inadequate management of the dog (37.5%). In this case, there was evidence that the owner of the dog had allowed the dog to be a danger to others in the past as indicated by previous bite incidents or allowing the dog to run at large. The owner abused or neglected the dog (21.6%). Neglect by an owner included the dog not being given access to shelter, food, or water or having an untreated medical condition. Abuse constituted cases where the dog was used for fighting or where there was clear evidence of deliberate physical punishment or deprivation. Clearly, reducing dog bites is the responsibility of all of us. Next month I will address some of the things that I believe we could all do that would help do just that. Here are my thoughts on what we can do to decrease the incidents of dog bites. First of all, we need to accept some basic facts. All dogs, irrespective of breed or how good they have always behaved in the past have the potential to bite. Most dogs give ample warning before biting, and if people would learn these signs, many dog bites could be prevented. Not all dogs will like all other dogs nor will they like every person just because that is what we want. If you have a dog that is aggressive and has bitten or has almost bitten, seek out professional help from your veterinarian and a Certified Dog Behavior Consultant immediately. The longer this behavior continues, the longer you delay, the lower the probability of changing the behavior. Biting is often an emotional response and training alone will not make your dog feel emotionally safe. There is no evidence to suggest that dogs will outgrow this behavior. Not all dogs with behavioral issues can be rehabilitated. Prospective Dog Owners – Do not get a dog on impulse nor should you get a dog without first meeting it in person. You will hopefully have your dog for many years, probably longer than you keep your automobile and perhaps the home where you live. You are making a lifetime commitment, so it is essential you choose wisely. Do your research before you start looking for a dog, Seek advice from trained professionals such as veterinarians, dog behavior consultants, and dog trainers. These individuals typically have knowledge and experience with a wide variety of dog breeds and temperaments and can provide less biased information than someone trying to convince you to adopt/purchase a dog. If you are unsure of your ability to evaluate a puppy/dog, consider hiring a qualified pet care professional to assist you. When you do agree to adopt/purchase a dog, make sure you have the return policy in writing. Breeders are often criticized, and shelters and rescues are often given a free pass; judge both critically. In the past several years we have had more clients complain about bad experiences with rescues than with breeders or pet stores. Those Selling/Placing Puppies – Please make sure your puppies stay with their mother and siblings until they are 7 to 8 weeks of age. Puppies that do not have this opportunity to learn are often more likely to develop behavioral issues. Shelters/Rescues – Rescue dogs, and I have had several, can be wonderful companions; however, they often have a rough start in life and thus have a higher probability of behavioral problems. Do your best to assess a dog’s behavior and to be completely and totally truthful about what you learn or suspect. Do not omit any information, even if you believe it will make the dog less adoptable. You are not doing your organization, or the dog, any favors when you adopt out a dog with a history of biting or aggression. Thoroughly assess, in-person, any potential adopter. Please make sure an adopter is physically and mentally equipped to care for the dog. Be especially careful with adoptions to the elderly who may have been able to care for their 12-year-old sedentary Doberman, but will find a young, hyperactive Doberman with behavioral issues beyond their capabilities, despite their best intentions. Understand that placements do not always work out. If a dog you have placed is threatening people in its new home or bites someone, be proactive in removing the dog immediately. Do not attempt to shame the family into keeping the dog by telling them that it will be euthanized or require that they keep the dog until you find a foster home. All Pet Professionals (Veterinarians, Dog Behavior Consultants, Dog Trainers, Boarding Kennel & Daycare Operators, Groomers, Shelters & Rescues) – Read and make sure you understand the American Animal Hospital Association 2015 AAHA Behavior Management Guidelines and adopt an official policy statement demonstrating your support of these standards. Ensure that you train all staff and volunteers on the basic premises of the guidelines as well as canine and feline behavior, canine, and feline body language, and the standard definition of bite levels. Commit to pain-free, force-free and fear-free pet care and make that philosophy a core part of your educational efforts in your community. Thank you to colleagues Mychelle Blake, CDBC, Gail Fisher, CDBC, Tracy Haskell, CPDT-KA, and ,Melissa McCue-McGrath, CPDT-KA for their input on this column. Green Acres Kennel Shop is very excited to be offering the Carnivore Meat Companies Vital Essentials® line of frozen and freeze-dried pet foods, snacks, and treats. As you probably know, Green Acres is pretty persnickety when it comes to adding a new food line. Just because a manufacturer or distributor wants us to sell their product does not mean we automatically say “Yes” and allow their products on our shelves. Even if we know a pet food is a big seller in other stores, if we are not comfortable with feeding that food to our pets, we will not sell it at Green Acres Kennel Shop. We first started looking at Vital Essentials in the fall of 2015, requesting information on the company and the products. After carefully reviewing the information provided, we were very impressed and took the next step; to try the product with our pets. We were extremely pleased with our pet’s reaction to the food and decided to add Vital Essentials to our offerings at the end of April of 2016. This is the same time Vital Essentials helped us bring Dr. Richard Patten to town to present two free seminars on pet nutrition. WI. After meeting with the company President and marketing, quality and production team, we are even more pleased to have Vital Essentials as part of our product line-up. Thank you for your hospitality and openness Lanny, Kevin, Erica and others! PIONEERS – Raw food for pets is a relatively new market segment, but Vital Essentials roots in the raw food for pets business goes back to 1968 and they have been involved in the meat industry for even longer. They are a pioneer in the raw pet food industry and know what they are doing. FAMILY OWNED & OPERATED – Vital Essentials is family owned and operated, and is a complete pet food company; they create the formulations, purchase the raw ingredients, produce, package and sell the food. From our twenty years of experience in this industry, we have observed that smaller companies like Vital Essentials produce a better product and are more committed to their retailers and end-users, you and your pets. We prefer working with companies that have control over the entire manufacturing process. Many companies without a manufacturing facility turn the production of their food over to another company, maybe even the lowest bidder. That is kind of like grandma having some big conglomerate try to make her famous yeast rolls. I know that would disappoint me. 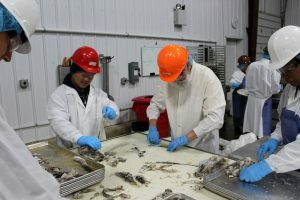 My point is, this, if the owner of the company does not actively supervise the selection of raw materials and the preparation of the food, how much control do they have over the quality of the food? I like that the owners of Vital Essentials monitor the quality of their food every day. PET FOCUSED – Vital Essentials only provides meat products for pets; they are not in the business of making candy, baby formula or jam like the conglomerates in the pet food industry; Mars, Nestle, and Smucker’s. During our visit, company President Lanny Viegut indicated that he views Vital Essentials more as a meat shop for pets, rather than as a pet food company. We like that description and its focus on pets. cats are carnivores that need meat in their diet and do not need soluble carbohydrates in the amounts found in most pet foods. 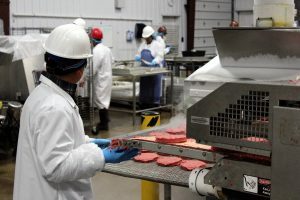 With their extensive experience in the meat processing industry, they know and understand that the manner in which livestock is raised and handled is critical to their foods nutritional value, and choose only the best raw materials for their product. QUALITY INGREDIENTS – The ingredients that go into Vital Essentials products are all sourced from America’s heartland. They use only USDA certified and inspected animal protein. No foreign ingredients go into any Vital Essentials products. Nor do Vital Essential products contain; added hormones or antibiotics, added fillers or flavorings, artificial preservatives or coloring, synthetic vitamins or minerals, or rendered by-products. Vital Essential products do contain whole meat, organs, and bones and are free of gluten and grain. NUTRITIONAL STANDARDS – Vital Essentials diets are formulated to meet the nutritional levels established by the AAFCO Dog and Cat Food Nutrient Profiles for all life stages. INNOVATIVE PROCESSING – Vital Essentials exclusive VE Freeze-Drying process retains all the active nutritional elements and allows the food to be safely and conveniently stored without refrigeration. Their 48 hour “slow” VE Freeze-Drying process locks in vital nutrients without cooking the RAW meat. The fresh, life-sustaining nutrients are NEVER lost during the VE Freeze-Drying process. INNOVATIVE PACKAGING – Vital Essentials freeze-dried foods and treats are packaged in bags impervious to oxygen, once sealed, and are flushed with nitrogen before the bag is sealed to remove all oxygen from the package. This keeps the food fresher. QUALITY STANDARDS – Vital Essentials products are made in a USDA Certified facility which means that they are packed under the continuous inspection of the USDA. Additionally, they are FDA registered and inspected, EU Certified and are also compliant with FSSC 22000 and the GFSI (Global Food Safety Initiative). 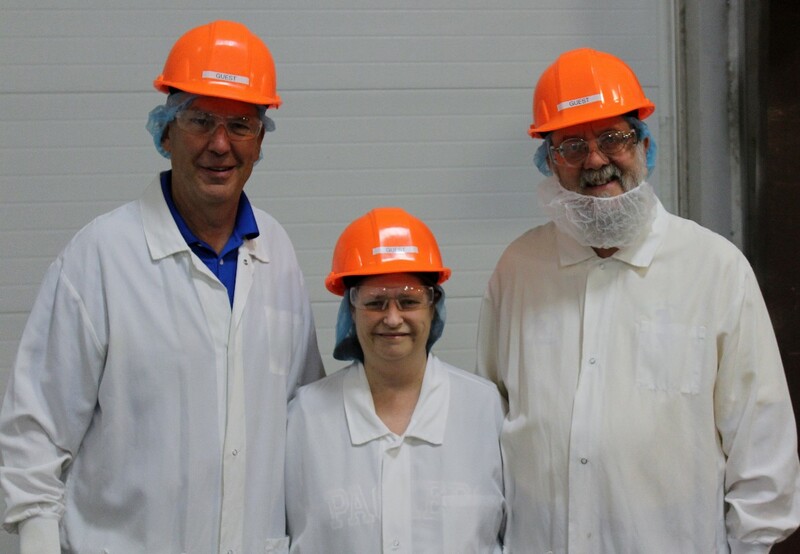 Paula and I had to read and sign-off on quality procedures before we could take the plant tour. We have visited other plants where that was not required. The quality standards at Vital Essentials are obviously very high, as they should be. 60 DAY GUARANTEE – The Vital Essentials 60 day consumer satisfaction guarantee gives you the freedom to try their products risk-free. If your pet has a hard time switching to Vital Essentials or just doesn’t like a certain protein you can return the product to the store where purchased for a full refund. SINGLE PROTEINS – The Vital Essential entrées are made with a single animal protein. This is critical if your dog has food insensitivities or intolerances. Because these foods are so simple and natural, they are an ideal choice for a pet that is intolerant or “allergic” to certain food ingredients. 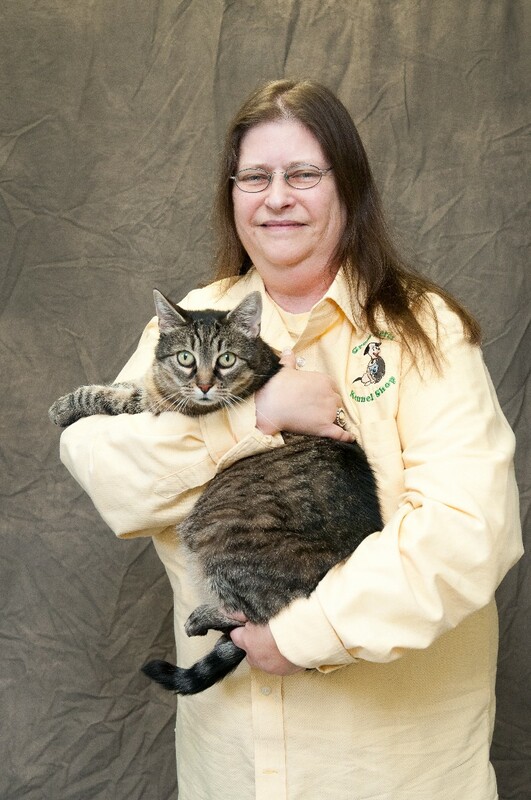 MULTIPLE PROTEIN CHOICES – Green Acres has been an advocate of rotating your pet’s diet for many years. The multiple protein options available from Vital Essentials make that very easy. DOGS – Flash frozen options are available in the following proteins; beef, chicken, duck, fish, rabbit, turkey and wild boar. Freeze-Dried options include; beef, chicken, duck, fish, rabbit, and turkey. 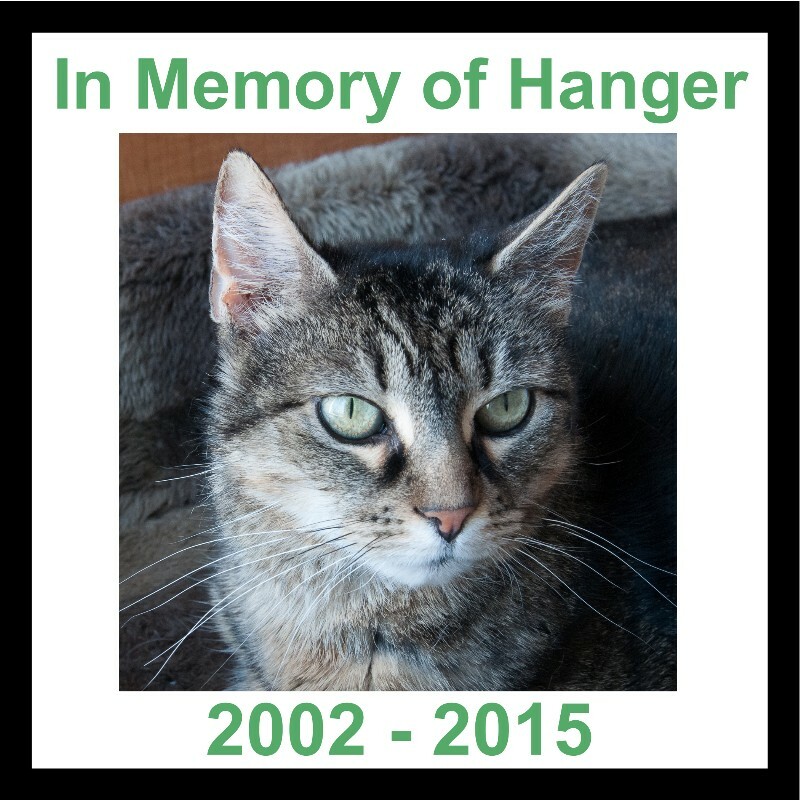 CATS – Freeze-dried options include; beef, chicken, duck, fish, and turkey. Watch for flash frozen options for cats coming soon! MULTIPLE FORMATS IN FROZEN AND FREEZE-DRIED PRODUCT – Depending on the size of your pet and the number of pets in your home, it is helpful to have various formats of food in different sizes available. If you have several large dogs, the Vital Essential chubs will be your most economical choice. If you have a smaller dog, you might find the mini-patties or nibblets to be the most convenient. You might prefer to feed frozen at home because it is less expensive, but choose to use freeze-dried when you travel because it needs no refrigeration, but is still as nutritious as the frozen food. We feed mostly frozen but always keep freeze-dried on hand for those times where we have not prepped frozen food ahead of time. Muppy loves either. DOGS – Vital Essentials frozen entrées are available as; nibblets 2oz mini patties, 8oz patties or 5lbs chubs. Freeze-dried entrées are available as toppers, mini-nibs, nibblets, mini-patties, and patties. CATS – Freeze-dried entrées are available as toppers and nibblets. Watch for flash frozen options coming soon! EASY TRANSITIONS – It is often beneficial to switch a pet to a new food slowly, Vital Essentials offers many different options for transitioning to their product. One of the easiest ways to do so is with their freeze-dried toppers. All you need to do is sprinkle some of the topper on your pets existing food, either at every meal or at a frequency that is within your budget. Even if you do not feed a raw diet on a regular basis, your pet will benefit and enjoy you the addition of toppers on an intermittent basis. do their food. Their freeze-dried training treats make an excellent choice for a high-value training treat. 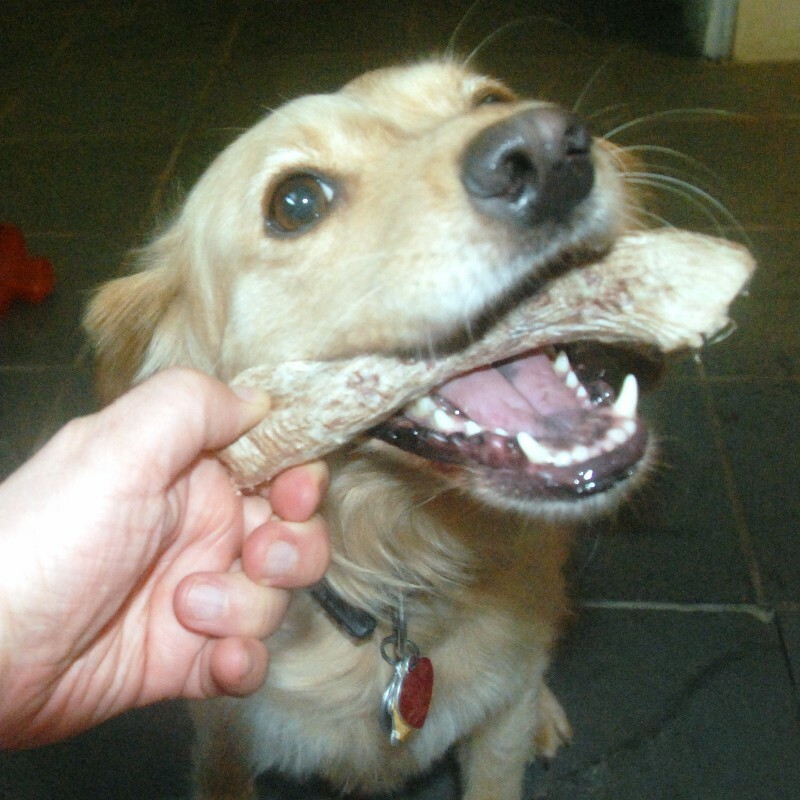 The snacks and frozen raw bones are an excellent alternative to less healthy choices like rawhides and plasticized dental treats. DOG TREATS – Freeze-Dried options include; beef nibs, beef tripe, chicken breast, chicken hearts, duck nibs, minnows, rabbit bites, turkey giblets, and wild Alaskan salmon. 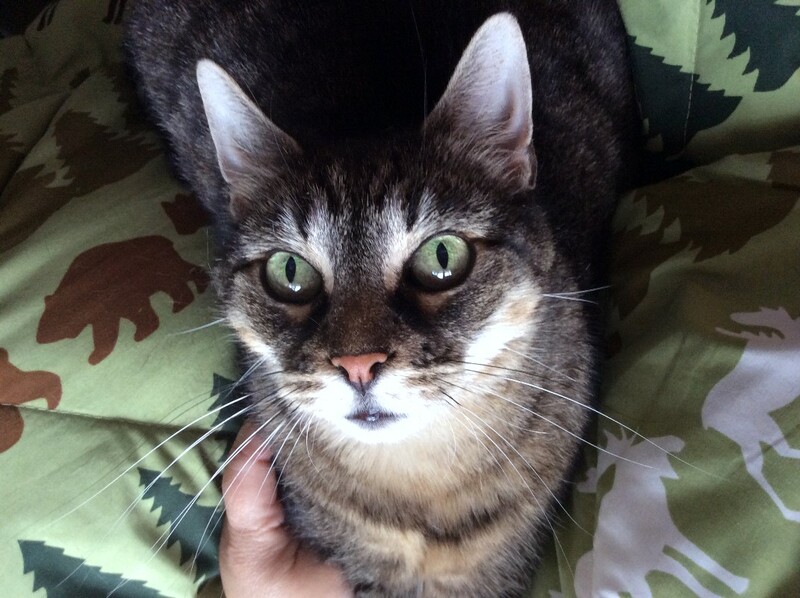 CAT TREATS – Freeze-dried cat treats include; ahi tuna, chicken breast, chicken giblets, duck liver, minnows, rabbit bites, wild Alaskan salmon. FREEZE-DRIED DOG SNACKS – Bully Sticks, Beef Tendons, Turkey Necks, and Salmon Skins are available as nutritious, snack options for your dog. FROZEN BEEF BONES – If you like including fresh frozen bones in your pets diet, you can rest assured that Vital Essentials prepares their spare ribs, center cut arm bones, and knee caps so that they are both safe and nutritious. TRIPE – Green Tripe is a great source of probiotics, calcium, digestive enzymes, and much more. Tripe promotes a healthy digestive system and boosts a pets’ immune systems. It is a super food for dogs and is available as frozen nibblets and patties or as freeze-dried I add a few nibblets to Muppy’s dish at almost every meal. The VE Raw Bar™ is an exciting new concept and Green Acres Kennel Shop is proud to be one of the first retailers to offer these healthy snacks for our pets. At the Raw Bar, you will find eleven exotic freeze-dried snack selections (chicken necks, duck necks, duck feet, turkey necks, turkey wings, turkey tails, pig ears, cod skins, salmon skins, bully sticks, and braided bully sticks.) VE snacks give your pet an added boost of vitamins, protein, and stimulation while helpings keep dogs’ teeth strong and healthy. From our perspective, this is a far better option than a plasticized dog treat. Muppy gives the VE Raw Bar 5 Woofs, her highest rating. 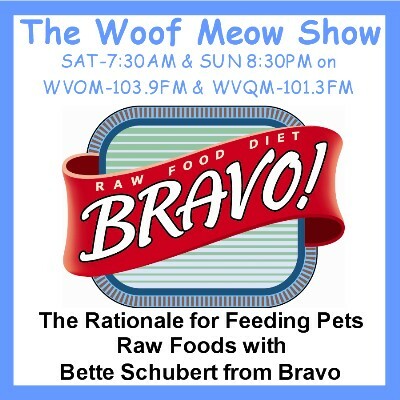 In this episode of The Woof Meow Show on August 3rd, 2013, Kate and Don interview Bette Schubert one of the founders of Bravo Pet Foods. 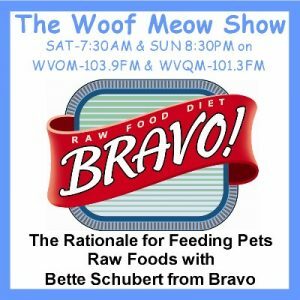 We discuss how and why Bette became one of the pioneers of the raw pet food industry. We will talk about the rationale for feeding our pets a diet of raw food and recent changes in regulations affecting the pet food industry.